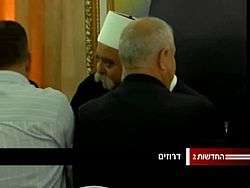 Video clips from the archive of Israel's channel 2 (Israel) news company showing Israeli Druze. The flags shown are the Druze flags. The Israeli Druze (Arabic: الدروز الإسرائيليون‎‎, Hebrew: דְּרוּזִים יִשְׂרְאֵלִים‎) are a unique religious and ethnic minority located in Israel. In 2012, there were 130,600 Druze living in the country. Even though the faith originally developed out of Ismaili Islam, Druze are often not considered Muslims. In 1957, the Israeli government designated the Druze a distinct ethnic community at the request of its communal leaders. 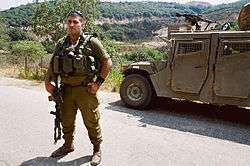 The Druze are Arabic-speaking citizens of Israel who serve in the Israel Defense Forces. Members of the community have attained top positions in Israeli politics and public service. Before the establishment of the State of Israel, the Druze were not recognized as a religious community and were discriminated against by the judicial system. They live mainly in the north of the country. While most of Israeli Druze identifies as ethnically Arab, today, tens of thousands of Israeli Druze belong to 'Druze Zionist' movements. The Druze (Arabic: درزي‎‎, derzī or durzī, plural دروز, durūz; Hebrew: דְּרוּזִים‎, druzim; they call themselves Al-Muwaḥḥidīn, lit. "the monotheists") are an esoteric monotheistic religious community found primarily in Syria, Lebanon, Israel, and Jordan. The religion incorporates elements of Ismailism, Gnosticism, Neoplatonism and other philosophies. The Druze call themselves Ahl al-Tawhid "People of Unitarianism or Monotheism" or al-Muwaḥḥidūn "Unitarians, Monotheists." Sheikh Amin Tarif was the preeminent religious leader of the community until his death in 1993. Druze citizens are prominent in the Israel Defense Forces and in politics. The bond between Jewish and Druze soldiers is commonly known by the term "a covenant of blood" (Hebrew: ברית דמים, brit damim). Five Druze lawmakers were elected to serve in the 18th Knesset, a disproportionately large number considering their population. Reda Mansour a Druze poet, historian and diplomat, explained: "We are the only non-Jewish minority that is drafted into the military, and we have an even higher percentage in the combat units and as officers than the Jewish members themselves. So we are considered a very nationalistic, patriotic community." Today, thousands of Israeli Druze belong to such 'Druze Zionist' movements. In 1973, Amel Nasser A-Din founded the Zionist Druze Circle, a group whose aim was to encourage the Druze to support the state of Israel fully and unreservedly. In 2007, Nabiah A-Din, mayor of Kisra-Sumei, rejected the "multi-cultural" Israeli constitution proposed by the Israeli Arab organization Adalah: "The state of Israel is Jewish state as well as a democratic state that espouses equality and elections. We invalidate and reject everything that the Adalah organization is requesting," he said. According to A-din, the fate of Druze and Circassians in Israel is intertwined with that of the state. "This is a blood pact, and a pact of the living. We are unwilling to support a substantial alteration to the nature of this state, to which we tied our destinies prior to its establishment," he said. As of 2005 there were 7,000 registered members in the Druze Zionist movement. In 2009, the movement held a Druze Zionist youth conference with 1,700 participants. In a survey conducted in 2008 by Dr. Yusuf Hassan of Tel Aviv University found that out of 764 Druze participants, more than 94% identify as "Druze-Israelis" in the religious and national context. On 30 June 2011, Haaretz reported that a growing number of Israeli Druze were joining elite units of the military, leaving the official Druze battalion, Herev, understaffed. This trend has led to calls for its disbandment. On May 15, 2015, it was announced that the Druze battalion Herev would be shut down thereby allowing Druze soldiers to integrate into the rest of the IDF, a wish that was relayed to IDF senior staff by leaders in the Druze community as well as former Herev battalion commanders. After the July 2015 Draft, the IDF no longer listed the Druze unit as an option. By September 2015, the battalion had been disbanded and its soldiers joined to other units. Druze also serve in elite units of the IDF such as the Sayeret Matkal and there are three Druze combat pilots serving in the Israeli Air Force. Today, thousands of Israeli Druze belong to 'Druze Zionist' movements. The Druze religion branched off from the religion of Islam, and although it is considered as its own religion separate from Islam, some Druze people still consider themselves as Muslims. The religion was created in the 10th and 11th centuries in Egypt with aspects of Hindu and Greek philosophy incorporated into the tenets of Islam. Conversions are not permitted in the Druze religion, because they believe that the first generation after the establishment of the Druze religion had an opportunity then to join the religion, and everyone alive today is reincarnated from that generation. Much like the Abrahamic faiths, the Druze religion is monotheistic, and recognize many prophets including Jesus, John the Baptist, Mohammed, and Moses. Their most respected prophet in their religion is Jethro, Moses' father-in-law. Within the Druze community, there are two different sub-groups. There is the al-Juhhal, or the Ignorant, and al-Uqqal, the Knowledgeable. The al-Juhhal group does not have the permission to view the holy texts, and they do not attend religious meetings. About 80% of the Druze people fall into this category of the Ignorant. The al-Uqqal must follow ascetic rulings including following a dress code. The most powerful 5% of the Knowledgeable group are where the spiritual leaders of the religion come from. As for important rules that the Druze must follow, they are not allowed to drink alcohol, eat pork, or smoke tobacco, similarly to the dietary laws in Islam. Polygamy is prohibited, and men and women are viewed as equals. Many of the Druze living in Israel fully participate in Israeli society, and many of them even serve in the Israeli Defense Forces. Druze Scouts march to Jethro's tomb. The Druze revere the father-in-law of Moses, Jethro or Reuel, a Kenite shepherd and priest of Midian. In Exodus, Moses' father-in-law is initially referred to as "Reuel" (Exodus 2:18) but then as "Jethro" (Exodus 3:1).. According to the biblical narrative, Jethro joined and assisted the Israelites in the desert during the Exodus, accepted monotheism, but ultimately rejoined his own people. The tomb of Jethro near Tiberias is the most important religious site for the Druze community and they gather there every April. Amin Tarif was the qadi, or spiritual leader, of the Druze in Palestine and Israel from 1928 until his death in 1993. He was highly esteemed and regarded by many within the community as the preeminent spiritual authority in the Druze world. In January 2004, the current spiritual leader, Sheikh Muwaffak Tarīf, called on all non-Jews in Israel to observe the Seven Noahide Laws as laid down in the Bible and expounded upon in Jewish tradition. The mayor of the Galilean city of Shefa-'Amr also signed the document. The declaration includes the commitment to make a "...better humane world based on the Seven Noahide Commandments and the values they represent commanded by the Creator to all mankind through Moses on Mount Sinai." There are four Druze villages on the Golan Heights which nowadays have about 20,000 residents. In the late 1970s, the Israeli government offered citizenship to all non-Israelis living in the Golan Heights, which would entitle them to an Israeli driver's license and enable them to travel freely in Israel. Most continue to regard themselves as Syrian citizens with, as of 2011, less than 10% having accepted Israeli citizenship. Those who apply for Israeli citizenship are entitled to vote, run for Knesset and receive an Israeli passport. For foreign travel, non-citizens are issued a laissez-passer-by the Israeli authorities. Since the adoption of the 1981 Golan Heights Law, the territory is under Israeli civil law, and incorporated into the Israeli system of local councils. As Israel does not recognize their Syrian citizenship, they are defined in Israeli records as "residents of the Golan Heights." In 2012, due to the Syrian Civil War, young Druze have applied for Israeli citizenship in much larger numbers than in previous years. Residents of Majdal Shams are not drafted by the Israel Defense Forces. Public support for the Syrian government of Bashar al-Assad has historically been high among Golan Druze. Assad's government is seen as a vital ally in their resistance to Israeli occupation, and has secured agreements with the Israeli government to permit Golan Druze to conduct trade across the border with Syria. Some tensions have recently arisen in the community due to differing stances on the Syrian Civil War, though open public support for the Syrian opposition is relatively uncommon. In the 2009 elections, 1,193 residents of Ghajar and 809 residents of the Druze villages were eligible voters, out of approximately 1,200 Ghajar residents and 12,600 Druze village residents who were of voting age. During the 2011 Syrian uprising, several rallies of Golan Heights Druzes were held in support of Syrian leader al-Assad. 1 2 "Sources of Population Growth, by District, Population Group and Religion" (PDF). CBS, Statistical abstract of Israel 2013. Israel Central Bureau of Statistics. 2013. Retrieved 15 June 2014. 1 2 Religious Freedoms: Druze. Theisraelproject.org. Retrieved on 2012-01-23. ↑ Aharon Layish (1982). Marriage, Divorce, and Succession in the Druze Family: A Study Based on Decisions of Druze Arbitrators and Religious Courts in Israel and the Golan Heights. Leiden, The Netherlands: E. J. Brill. p. 12. ISBN 90-04-06412-5. Retrieved 14 October 2014. ↑ Dr. Naim Aridi. "The Druze in Israel: History & Overview". Jewish Virtual Library. Retrieved 2012-01-23. 1 2 3 4 Eli Ashkenazi (3 November 2005). הרצל והתקווה בחגיגות 30 לתנועה הדרוזית הציונית [Herzl and hope in celebrating 30 (years of the) Druze Zionist movement]. Haaretz (in Hebrew). Retrieved 14 October 2014. ↑ Pace, Eric (1993-10-05). "Sheik Amin Tarif, Arab Druse Leader In Israel, Dies at 95". The New York Times. Retrieved 2010-03-29. ↑ Firro, Kais (2006-08-15). "Druze Herev Battalion Fights 32 Days With No Casualties". Arutz Sheva. ↑ Stern, Yoav (2011-08-03). "Elections 2009 / Druze likely to comprise 5% of next Knesset, despite small population". Haaretz. Retrieved 2012-01-23. ↑ Christensen, John (15 November 2008). "Consul General is an Arab Who Represents Israel Well". Atlanta Journal-Constitution. Archived from the original on 29 June 2011. Retrieved 27 June 2010. ↑ Kais Firro (1999). The Druzes in the Jewish state: a brief history. Social, Economic and Political Studies of the Middle East. Brill Academic Pub. p. 210. ISBN 978-9004112513. ↑ Mordechai Nisan (2002). Minorities in the Middle East: a history of struggle and self-expression (2nd ed.). McFarland & Company. p. 109. ISBN 978-0786413751. ↑ Jacob M. Landau (1993). The Arab minority in Israel, 1967–1991: political aspects. Oxford University Press. p. 46. ISBN 978-0198277125. ↑ Stern, Yoav (1 March 2007). "Druze, Circassian forum: Israel should remain a Jewish state". Haaretz. Retrieved 22 June 2010. ↑ Samar Odeh (9 December 2009). הציונות הדרוזית היא אהבת מדינת ישראל והתרומה למדינת ישראל ['Druze Zionism is the love of the state of Israel and contribution to the state of Israel'] (in Hebrew). Radio Haifa. Archived from the original on 21 July 2011. ↑ Shtern, Yoav (4 March 2008). "רה"מ לדרוזים: לא עוד ברית דמים, אלא ברית חיים [PM to Druze: No more blood pact, but life pact]". Walla!. Retrieved 26 June 2016. ↑ "Study: 94% of Druze in Israel define themselves as Druze-Israeli". Ynet. 4 March 2008. Retrieved 26 June 2016. ↑ Yaakov Lappin (15 May 2015). "To promote integration, IDF shuts down Druse battalion". Jerusalem Post. Retrieved 18 May 2015. ↑ "Druze Religion." International Fellowship of Christians and Jews. http://www.ifcj.org/learn/inside-israel/people-society/religions-of-israel/druze-religion.html. 1 2 3 "Islam Religious Leader Commits to Noahide "Seven Laws of Noah"". Institute of Noahide Code. Retrieved 2007-07-15. ↑ Dana, Nissim (2003). The Druze in the Middle East: their faith, leadership, identity and status. Sussex Academic Press. p. 14. ISBN 978-1903900369. ↑ Isabel Kershner (2011-05-22). "In the Golan Heights, Anxious Eyes Look East". The New York Times. Retrieved 2012-01-23. ↑ Ilan Ben Zion (5 October 2012). "With Syria ablaze, dozens of Golan Heights Druze seek Israeli citizenship". The Times of Israel. Retrieved 14 October 2014. ↑ Stratford, Charles (28 September 2012). "Golan's Druze divided over Syria unrest". Majdal Shams: Al Jazeera English. Retrieved 28 November 2012. ↑ Luis Ramirez (2 May 2011). "Israeli Druze Keep An Eye Across Fence as Syria Upheaval Unfolds". Voice of America. Retrieved 2 May 2011. Mordechai Nisan (Autumn 2010). "The Druze in Israel: Questions of Identity, Citizenship, and Patriotism". The Middle East Journal. 64 (4): 575–596. doi:10.3751/64.4.14.